Ethereum is one of the most popular Cryptocurrencies that you can invest in and it's very easy to buy Ethereum. Not only does the Ethereum Coin have great potential for the future, but you can also use it to buy other coins on exchanges. Most newbies first steps into trading Cryptocurrency begins with buying either Bitcoin or Ethereum, so purchasing Ethereum is great first step to take. Buying Ethereum involves exchanging your real world currency into Ethereum via an Exchange. Anyone new to Cryptocurrency often gets discouraged by the complicated nature of this process, thus I've made this guide to help guide newbies into purchasing their first Cryptocurrency Coins. You can see how much Ethereum is currently trading at on Coinmarketcap. To exchange our real world currency into Cryptocurrency, we first need to sign up to a site that facilitates this. We'll be using Coinbase to do this, which is an Exchange based in California. It currently operates in more than 32 countries and is one of the most modern websites to offer an interface for buying and selling Cryptocurrency. Coinbase supports a number of different Cryptocurrency Coins you can purchase, including Bitcoin, Litecoin, Bitcoin Cash and Ethereum. Go ahead and sign up at Coinbase right away. You'll want to make sure you enter your correct personal information as this will be used to verify your identity. Coinbase has a strict verification process, so skimming on details will likely lead to your account not being accepted. 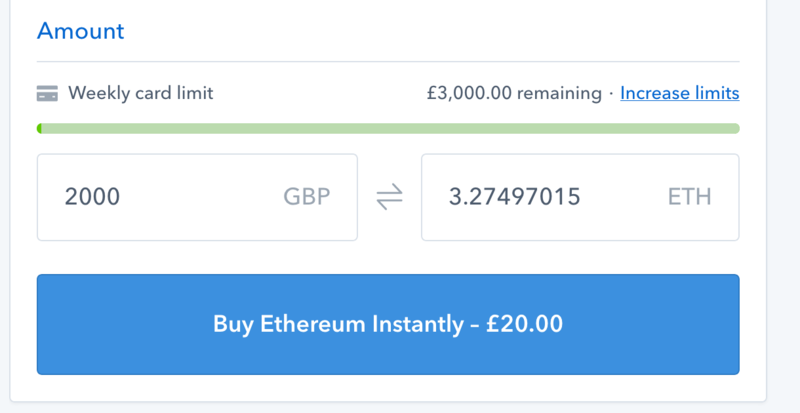 I'm from the UK, so when buying Ethereum in the UK the prices are in pounds. If you're buying Ethereum from the USA, they will be displayed in dollars. Each of these methods will require you to take a picture of some form of identity card. Personally, I used my driver's license (you have to take a photo of both the front and the back). You can use your smartphone to photograph your ID, just make sure the quality is good enough to make out the details. This verification process can take anywhere from a couple of minutes to a couple of days. It really depends on whether the verification you submitted is of a good quality and if Coinbase is in high demand. Make sure your photograph is not blurry or pixelated. Make sure your photograph isn't cropping out a part of the ID. Make sure your photograph of your ID matches up with the information you provided with Coinbase. 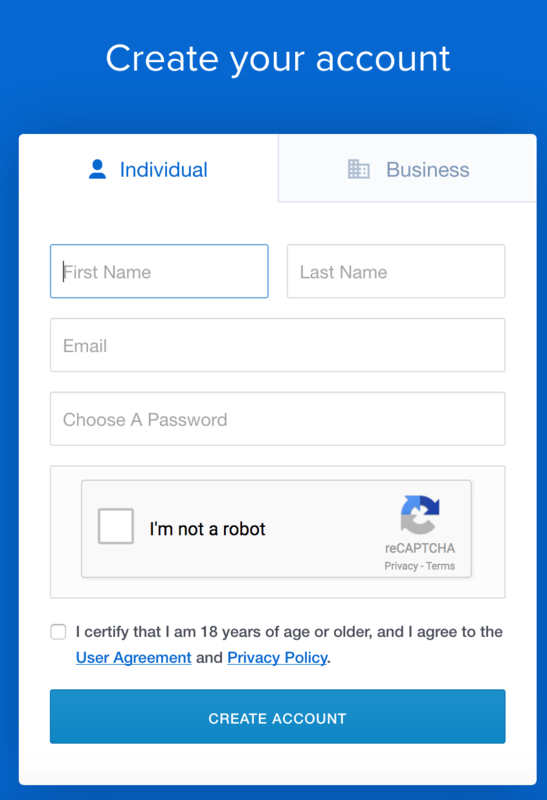 This verification support article on Coinbase can provide some responses. You'll usually provide Coinbase your Phone number and once you've been verified, you should get SMS confirmation too. Once submitted, be patient. If you submit multiple requests, it can sometimes slow down your application. Once you have a verified account on Coinbase, you can finally buy Ethereum. 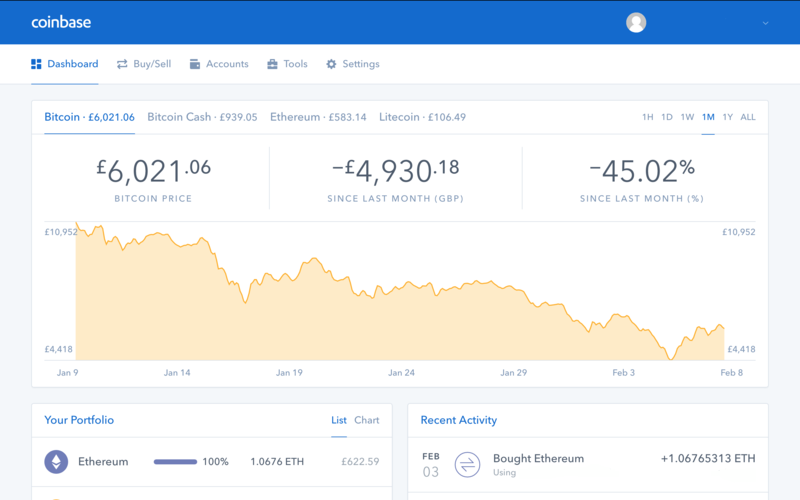 When you first login to Coinbase, you'll be presented with a Dashboard with a summary of the price of the cryptocurrencies that you can purchase. If you click on the Ethereum tab, you can see the current price at which Ethereum is trading at. The price stated is that equal to one Ethereum coin. But don't worry, you can purchase fractional amounts of Ethereum of any value you want to invest it. So if you have $200.00 and Ethereum is worth $700, you can still invest., you'll just end up with 0.348328 Ethereum instead. But first things first, you need to add a payment method. You can either add your Bank account directly or a debit/credit card. The limits for these two methods are different, but you'll find adding a debit/credit card a lot easier (as simple as if checking out in an online shop). Head over to the Settings page and then click on the Linked Accounts page. In the top right corner is a button labelled Link A New Account. Click it and enter your details. As mentioned, you can buy from four different cryptocurrencies. We want Ethereum, so click the Ethereum Icon so that it's highlighted. Next you'll want to enter how much Ethereum you want to buy. You can enter a $ amount or an Ethereum amount. The system will update either side so that it shows you how much Ethereum/Dollar you are purchasing. New accounts have a weekly limit of how much they can purchase at once. In the UK, this amount is £750.00 and in the US it's $1,000 USD. These values are constantly changing, so when you sign up, this amount may be different. Each week the values reset, so you can purchase more by waiting and you can increase your weekly limit by having an older account. Once you are satisfied with what you want, click the Buy button. Depending on your payment method, your payment will then be subject to verification by your bank and processed by Coinbase. Purchases are usually instant and will show up in your account. Click on Accounts tab. 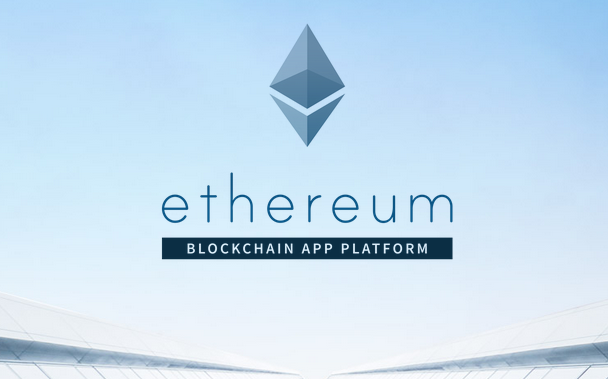 Scroll down to the Ethereum icon and click it to load your recent purchase of Ethereum. Congratulations, you now have purchased your first cryptocurrency! You can now either leave it on the exchange and sell it when it's value increases or move it to a wallet, which is a more secure location to hold your cryptocurrency coins. Once Ethereum reaches a certain price, you may wish to sell it back into your real world currency. Luckily for you, selling is just as easy as buying. 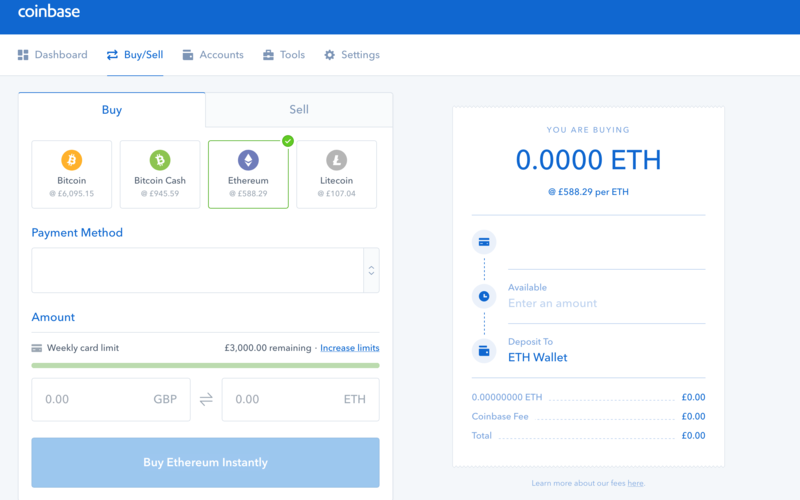 Simply click the Sell tab on the Buy/Sell page on Coinbase and list how much Ethereum you want to sell. When you sell the cryptocurrency, it'll be deposited into your "real-world" currency wallet. You can then withdraw the money from this wallet to your Bank via Coinbase. There are sell limits for new accounts, but these are quite high anyway so unless your buying and selling hundreds of thousands, I doubt this will be a problem. These limits increase the older your account becomes and refresh each week. Keeping your funds on an exchange can be a risky way to store your funds. There have been many examples of exchanges suffering hacks where the coins are stolen and many people losing hundreds of thousands of dollars. You only have to look at the Mt. Gox case which caused the price of Bitcoin and others to fall sharply due to how severe it was. The best way to keep your Cryptocurrency safe is to use a Wallet. A wallet acts as a storage device that only you can access via a Private Key. You can transfer your Ethereum to one of these wallets and keep it safe until you're ready to use it again. There are many different Wallets you can use to store your Ethereum coins. For this tutorial, we'll be looking at the popular MyEtherWallet, which is free to use and has a web-interface allowing you to manage your different coins. MyEtherWallet can be used to store any cryptocurrency that is based on the Ethereum blockchain. You can't store Bitcoin on this type of wallet. It doesn't take long to setup a wallet, so we'll go through step by step on how to do it. Head over to MyEtherWallet and you'll be presented with a page to create a new wallet. MyEtherWallet uses a combination of both Private Key and Password to unlock the wallet. 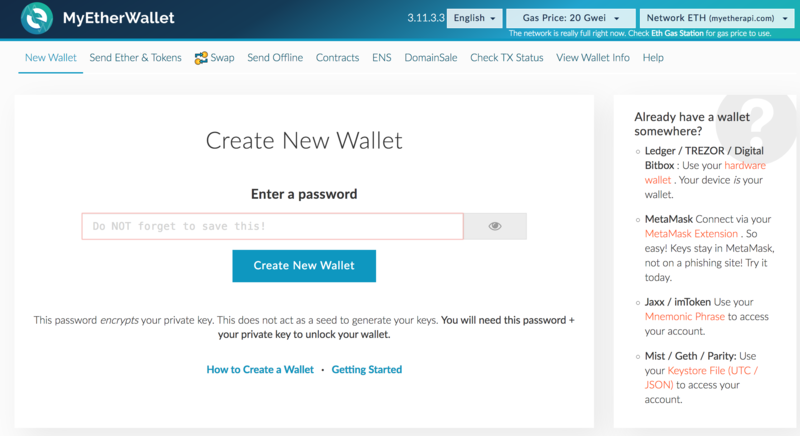 Simply enter a strong password into the Create Wallet page and you'll be taken to the next step. Next you'll be asked to download the keystore file. This contains your Private Key and is used as a quickway to unlock your wallet (you don't have to type in the Private Key everytime you unlock the wallet). Save it somewhere safe and continue to the next screen, where you'll be given your private key. This string of characters is what is used to unlock your wallet. You can copy this address in a offline file or even write it down/print it off. You've successfully created your own Wallet! It's simple and that easy. For extra security, you can create multiple wallets and keep your funds spread across multiple places. Now we need to send our Ethereum on Coinbase to our Wallet. 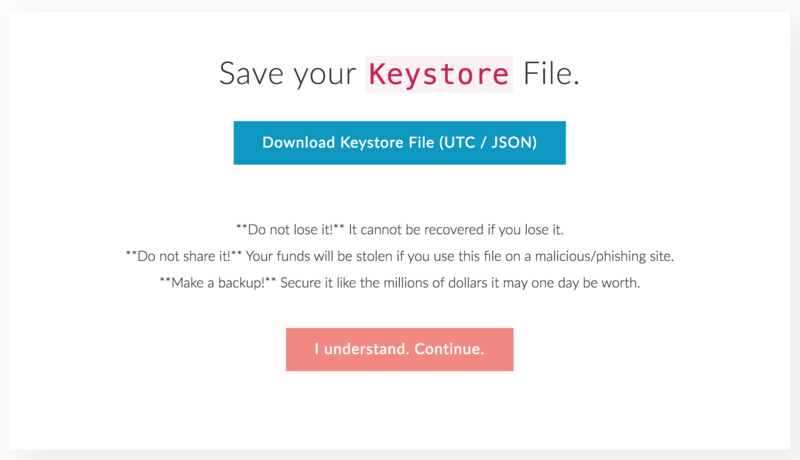 First we need to unlock the wallet using our keystore file and password to obtain our Wallet's address. This is what's commonly known as a Public Key or Public Address. You do this on MyEtherWallet. Once unlocked, your Wallet's Address is displayed in the corner. You can give this out to anyone who you want to send you funds. No one can hack your wallet with your public address. Now that you have your Wallet's address, head back to Coinbase and click on the Accounts tab. This time, on the Ethereum section, click the Send button. A window will open with an address field. Enter your Wallet's address (double check that this is correct! If you send it to the wrong address, you'll lose everything you've sent! 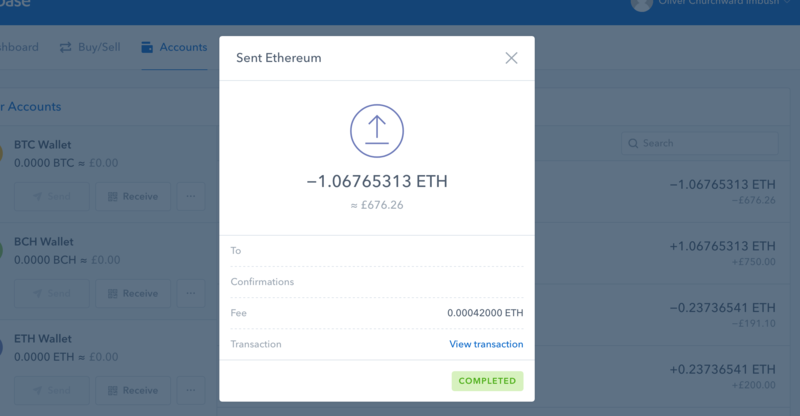 ), enter the amount of Ethereum you wish to send and then hit the send button. It can take a little while to turn up in your Wallet depending on how congested the Ethereum blockchain is, but you can track the progress of the transaction using Etherscan. If you click on the pending request in Coinbase, it will bring up a window with a transaction link. Click it and it will open up in Etherscan, showing you when the transaction was made and whether it has successfully been confirmed. Your Ethereum will now show up in your wallet in due course. Once it has, you want to store your private key offline somewhere, along with your password to keep it safe. As long as you never give out this information, your coins are safe. If this guide helped you, feel free to leave a comment on how I can improve it or if you have any suggestions/queries.